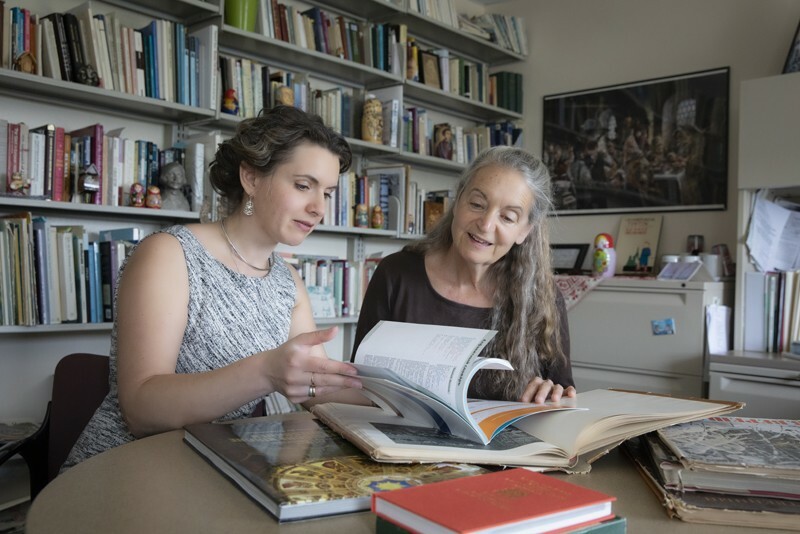 Marina Zalesski, left, and Nancy Tittler are among the faculty members instructing Harpur College students in Russian cultural, language and literature classes. Image Credit: Jonathan Cohen. Marina Zalesski, left, and Nancy Tittler are among the faculty members instructing Harpur College students in Russian cultural, language and literature classes. Photography: Jonathan Cohen. Sitting around the table sharing borscht and stuffed cabbage, students pass dishes and say spasibo (thank you) to one another in the comfort of their instructor’s home. This happens each year when Nancy Tittler invites her Russian-language students to her house to share food, language and - most importantly - culture. A small program in Harpur College, the Russian Studies major at Binghamton University is the sole Russian Studies program in the 64-campus SUNY system. Currently, it is offered through the German and Russian Studies Department. The program originated in the early 1980s. Since then, the popularity of Russian Studies has fluctuated due in part to the political climate, says Tittler, a senior instructor of Russian and director of undergraduate studies. In 1980, Tittler was asked to start a beginning Russian class at Binghamton University. In 1983, the class was incorporated into the German Department. By 1995, Tittler and her colleagues shaped a Russian major under the Individualized Major Program (IMP). There is also a variety of cultural studies and literature classes such as Slavic Folklore, Russia and the World, Russia’s Defiant Women, Russians in Soviet Cinema, and Activism in Russia - all of which are taught in English for everyone to take. Because it is a small program, the classes lean heavily on student input. While the number of students taking languages is smaller than for other subjects, it doesn’t mean that learning Russian is undervalued. Marina Zalesski, a lecturer in Russian, believes it’s tied to cultural attitudes. And for Zalesski, who is fluent in both Russian and English, learning another language is more than just about being multilingual. This means opening your mind to a new culture and undoing some previous biases, she says. Students who have studied Russian see their education paying off as the politics between the United States and Russia become more polarized. Nina DePalma ‘13, who taught English in Russia after graduation, believes her teaching experience and university education dramatically changed her outlook despite what she was seeing in the world around her. By learning about a country’s culture, you can connect with the people on a level that humanizes them - apart from how their government is defined in the media, Zalesski says. Knowing the language, students are able to travel abroad and connect face-to-face with the people they’ve been learning about in their textbooks. “It cannot be done through documentary films. You have to live through it. You have to learn about it in order to gain a true understanding of how things are,” Zalesski says.